Leather pieces of furniture need regular cleaning done with suitable detergents and products which are recommended by their manufacturer. If you use conventional cleaning preparations you risk to damage your sofas beyond repair. 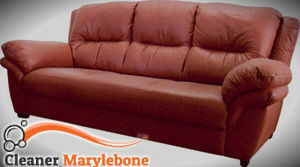 We offer excellent leather sofa cleaning which can be used by the residents who live in Marylebone and nearby. Book our trustworthy services to keep your leather sofas in perfect condition and use them long time. We guarantee you great results of our staff’s work. Our staff check the condition and type of leather to choose the most appropriate detergents for cleaning it. They test the products and utilize sponges and brushes to remove the stains, spillages and grime from the leather fabric. Then, the sofa is wiped with microfibre clothes and the most suitable sealants: oils or waxes are spread onto it. Having been trained on a regular basis and possessing the necessary expertise, our staff can implement effective sanitising of all kinds of leather fabrics. They can consult you how often to have your sofas cleaned and carry out the work in a professional manner. 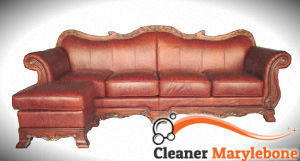 Our leather sofa cleaning services are available in Marylebone, W1U from Monday to Sunday at reasonable rates. If you need help with the maintenance of your leather sofas use our reliable services to get the expected outcome. The cleaners who work for us know how to sanitise various natural and synthetic fabrics without inflicting any damage on them. They can save your expensive furniture investments from early cracking, flaking, tearing and easy staining. Our leather sofa cleaning can be used seven days per week in Marylebone by homeowners and holders of commercial estates.